Functional Programming in Scala is a serious tutorial for programmers looking to learn FP and apply it to the everyday business of coding. The book guides readers from basic techniques to advanced topics in a logical, concise, and clear progression. In it, you'll find concrete examples and exercises that open up the world of functional programming. Functional Programming in Scala is a serious tutorial for programmers looking to learn FP and apply it to their everyday work. The book guides readers from basic techniques to advanced topics in a logical, concise, and clear progression. In it, you'll find concrete examples and exercises that open up the world of functional programming. This book assumes no prior experience with functional programming. Some prior exposure to Scala or Java is helpful. The free sample PDF available here contains Chapters One and Two. To purchase the full book, please go to www.manning.com. All registrants qualify for the Typesafe discount and will save 40% on the full book "Functional Programming in Scala" by referencing promotional code tsfp14. If you are interested in purchasing the full book get it here. Offer only valid at manning.com. 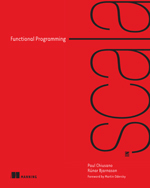 Please enter your information to receive your E-book copy of a subset of Functional Programming in Scala by Paul Chiusano and Rúnar Bjarnason and be signed up for the Lightbend Newsletter. Once you've entered your information and submitted the form, the PDF will be emailed to your address.